The CoffeeShop Blog: CoffeeShop "Valentine Paper Pack #2"
CoffeeShop "Valentine Paper Pack #2"
We are finally over our "Cold from Hades"! Wow, that stupid virus just hung around for what seemed forever and a day. I have a new action and preset coming out this week, but today I wanted to share a new Valentine-themed digital paper pack. I hope you enjoy using these in your own designs! 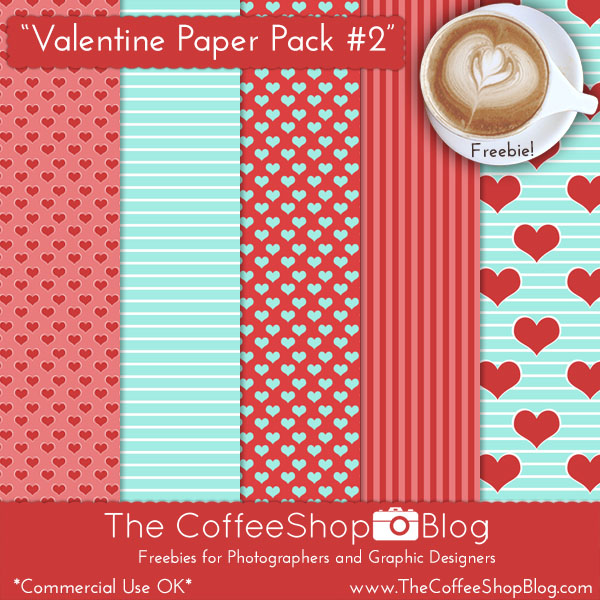 Download the CoffeeShop "Valentine Paper Pack #2". Glad to hear that you guys are on the mend. Such a popular colour combo right now. I'm doing new release posts for a designer I work for who has just released a number of sets with this same colour palette. Definitely an 'in' palette! Thank you Lisa! I love that color combo, it works for Christmas too. Whenever I go somewhere I always note colors is displays and they end up in my work. LOVE these colors together! Thank you so much!